WASHINGTON – President Barack Obama has declared the threat of chemical or biological warfare in Syria a “red line” for the United States, outlining for the first time the point at which his administration could feel forced to intervene militarily in the Arab country’s increasingly messy conflict. Speaking to reporters Monday at the White House, Obama warned about the use or deployment of such weapons of mass destruction and said they risked widening a civil war that already has dragged on for 1½ years and killed some 20,000 people, according to activists. It is widely thought that Syria possesses extensive chemical and biological weapon stockpiles, and it has threatened to use them if the country comes under foreign attack. If the USA does get involved in direct military intervention against Syria, it may not go as well for the USA, as for example, Libya has thus far seemed to. The world is more dangerous than many Americans truly realize. As regular readers of this new page are aware, I have been warning since last year that Russia does not need Syria as much as Syria needs it. Russia is attempting to have a diplomatic role here–and partially has supported Syria because of how it has felt betrayed by the West over Libya. The Bible shows that Syria’s capital city Damascus (Isaiah 7:8) will be destroyed (Isaiah 17:1). Whether this will happen because of internal civil war or an attack involving Israel and possibly the USA remains to be seen–it is not likely to directly involve Russia. 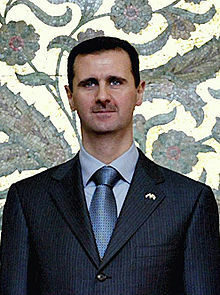 Syria’s Assad remains a close ally to Iran and Iran keeps taking steps that may provoke a regional (with Israel) or larger war (the USA itself could sustain damage). But whether it is involved in a war involving Israel or not, eventually, Damascus has to be destroyed, and probably relatively soon. What may happen is a regional war, that somewhat gets out of control and may involve Syria (Syria could also change because of its own internal war) and others (including possibly many based in Lebanon) beyond Iran and Israel, is something I have warned could happen for some time now and really could be a factor that ultimately leads to the fulfillment of Daniel 9:27. This entry was posted on Wednesday, August 22nd, 2012 at 7:02 am	and is filed under Prophecy.